What's The Best Cider You've Had? Mine is Henry Westons Special Reserve 8.2%. The best cider I had was a perry. Not strictly cider but farmhouse Perry. Superb but you don't have long to drink it, about three days so don;t buy much. Before wine began to get the snob value Perry was the aristos drink of choice. Perry <> pear cider. Which is a far inferior product. "Pear cider" says to me that the manufacturer doesn't know what the ****** he is doing so just covered all bases. 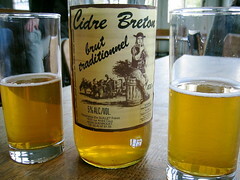 Breton Cider. Not strong, about 4-5%, just a really nice drink. I can't bear that headbanging stuff. Some Somerset rough cider from a jerry can. That's cider to me. You mean the jerry can with the dead rat at the bottom ? But my comment on the beer thread applies here too: a good publican is critical. They know exactly what they are doing and the term "pear cider" is a deliberate choice since they would be misleading customers if they used the term 'perry'. Some of the pear ciders contain as much apple juice as pear juice (and even more added water). Lack of supply of true perry pears means that even that pear juice is likely to have come from a dessert pear. You can no more make good perry from these pears than you could make good cider from 'golden delicious' apples. Thus the wording 'pear cider' which does not mean anything. Yes, Henry Westons is very good. I am more of a perry man which, arguably, Westons is. As long as it is Wood pressed. I hate the metallic taste you get in many ciders. I only tsarted drinking cider again about 2 or 3 years ago after not drinking it since I was a teen. Drank some strongbow around 17, hated it and was very sick from it - only had a glass - and assumed that all cider was like strongbow. Took me 25 years to work out that it isn't.